Deep water culture is a method used to grow plants with roots submerged in highly oxygenated nutrient solution. Our Deep Water Current systems are an all new large heavy duty design for those wanting to grow fewer larger plants. The growth in these systems is explosive due to the unlimited supply of super oxygenated nutrient solution being constantly recirculated 24/7 by an inline pump that creates a current drawing the solution through the pots. This system comes in two sizes, either 20 litre pots or our heavy duty XL 27 litre pot version. The gentle current passes underneath the 100mm mesh pots delivering vital nutrients to the roots, optimizing root zone health and increasing nutrient uptake efficiency. This method of Deep Water Culture maintains uniform PH and EC levels throughout the entire system. There are no timers to set up, just plug in and grow! 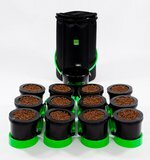 The 20 litre pots are linked together with a row of 32mm pipe and fittings whereas the XL 27 litre pots are linked together with two rows. This allows for a free flowing system, recirculating the nutrient solution seven times an hour. The larger diameter pipe also helps address the issue of the roots blocking the pipe. Air lines are connected to each pot to aerate the solution. Our XL air kits include the Enviro ET series air pumps which are a very high quality super silent pump, 100mm air stones and the air lines are our own alien green flexible PVC which does not kink like cheap silicone comparisons. The 20 litre kits use Hailea V series pumps which are also silent. The Budbox Aqua Tanks that we supply are a collapsible water tank allowing the whole system to fit through tight spaces where other bulky plastic water butts cannot. The Aquatank comes flat packed so the entire system fits neatly into a cardboard box allowing for easier transportation. The material is non toxic and 100% lightproof. 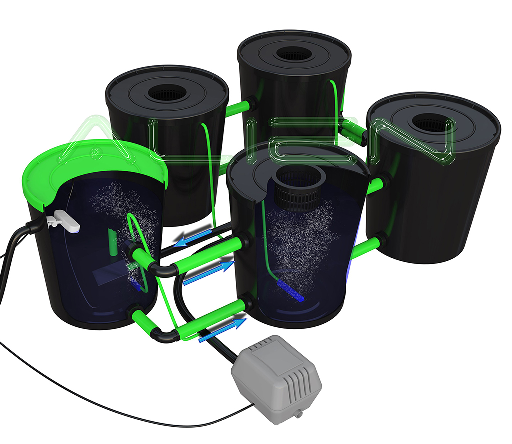 The Aqua tank is connected to the header pot and by means of a ajustable float valve the nutrient solution level is automatically maintained. You can raise or lower the nutrient solution level in the entire system to suit your plants requirements. To keep system set up time to a minimum the pots have pre-punched holes. With each system a pair of quality pipe cutters are provided so no tools are required. We use our own specially designed grommets to ensure secure and water tight connections. The entire system is simply push fit.